Before heading home after a recent family visit to attend the Philadelphia Flower Show, we stopped to see the Liberty Bell. One of the most interesting aspects of the bell’s history (which I hadn’t fully appreciated before my visit) is that for almost the first hundred years of its life (it was cast in 1753) it didn’t really serve as a symbol of liberty or freedom, despite the quote from Leviticus 25:10 (“Proclaim LIBERTY throughout all the Land unto all the Inhabitants thereof”) inscribed on the bell. 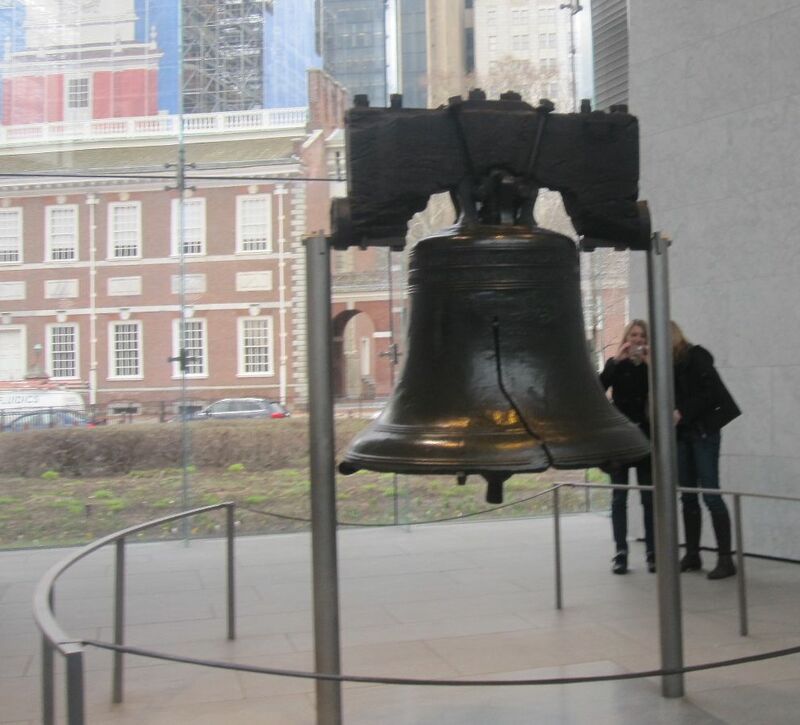 It was simply the bell that hung in the Pennsylvania State House and was rung on special occasions, including possibly on July 8, 1776, to mark the reading of the Declaration of Independence. The State House bell was actually named the Liberty Bell in the 1830s by abolitionists, who called on the nation to fulfill the promise of the bell’s inscription to those millions of inhabitants thereof who were enslaved. The idea of the bell as a symbol of liberty took fire during the decades before and after the Civil War (helped along by some 19th-century patriotic myth-making), and it’s been subsequently adopted in turn by multiple groups and causes, from the women’s suffrage movement of the early 1900s (which featured a replica Woman’s Liberty Bell) to a U.S. Savings Bond campaign in the 1950s that portrayed the bell as a symbol of freedom in opposition to communism. That campaign featured the distribution of replica bells to all 50 states, the District of Columbia, and various U.S. territories, and many other replicas have been placed around the country and around the world. Maryland’s version of the bell is unfortunately hidden away on the campus of St. John’s College, but others serve as public rallying points. For example, the Liberty Bell replica in Bakersfield, California (erected as part of the 1976 bicentennial) has served as a venue for a diverse set of events and causes: a Tea Party Patriots Tax Day Rally, the 31st annual Pride Rally by the Bakersfield gay community, a local National Day of Prayer rally, protests against education funding cuts, a celebration of medical marijuana legislation, and local events by civil rights activists and labor unions. Despite the diversity, all of these events have at their heart support and celebration of some aspect of liberty and freedom. As I’ve noted previously, I’ve been recently reading and commenting on the Bleeding Heart Libertarians blog. Jason Brennan, one of the founders of the blog, is the co-author (with David Schmidtz) of A Brief History of Liberty , which discusses the varying concepts of liberty that have arisen over the years, including political liberty and the rule of law, religious freedom, free markets, civil rights, and personal independence and psychological freedom. Although it’s marketed as part of a history of philosophy series, A Brief History of Liberty is a really excellent introduction for general readers and can be profitably consulted by anyone no matter where they sit on the political spectrum (or on the Nolan Chart, if you’re into that). Conservatives and libertarians should read it for a good discussion of liberty as capability, i.e., the point that absence of restraint on personal action can and in many people’s minds should be complemented by measures to ensure that every person is able to profitably take advantage of that freedom. This includes ensuring that every person receives an adequate education, is protected against catastrophic and economically ruinous health problems, and is otherwise equipped to be a productive member of society. In a Howard County context the school system, the public library system (which aims to provide high-quality public education for all ages), and initiatives like the Plan to End Homelessness [pdf] (spearheaded by the aptly named Board to Promote Self-Sufficiency) can all be seen as supporting this goal. Liberals (in the modern sense) and progressives should in turn read A Brief History of Liberty for a robust defense of a free market economy and its ability to promote general prosperity and provide a quality of life even for the poorest families that is greatly improved over that experienced by most people outside the developed world. You don’t need to be a Randian to believe that doing business is a capitalistic society is a worthy endeavor, and you don’t have to be a Chamber of Commerce lobbyist to question whether government sometimes over-steps in regulating businesses. To give but two examples, locally we’ve seen a long-running controversy about allowing direct shipping of wine to Maryland consumers (and more recently about siting wineries within Howard County), and I’ve blogged about Maryland restrictions on direct-to-consumer genetic testing. These may seem like relatively trivial issues of interest only to a few (and relatively privileged) Marylanders, but many business activities can be portrayed as trivial in the grand scheme of things and yet still help contribute to overall prosperity of our community. And in these particular examples what may seem on the surface like relatively benign paternalism (“We’re just trying to prevent minors from getting access to alcohol” or “We’re concerned about naïve people misinterpreting these tests”) masks special interests (liquor wholesalers or doctors) using government to help maintain their economic positions against perceived competitors. I’ll close by looking elsewhere in the world to note that liberty isn’t necessarily as simple as it seems, no matter your political persuasion. For example, country A has a very favorable business climate, with a significantly lower corporate tax rate than the U.S., no government-mandated minimum wage, and a flexible regulatory framework hailed by a major U.S. conservative think tank as highly conducive to innovation and productivity growth. Surely, a progressive might say, this country’s people are at the mercy of rapacious corporations bent on exploiting their workers. On the other hand, country B has one of the highest tax burdens in the world, with the government talking over half of GDP to fund an extensive set of social services. Surely, a conservative might say, this is an example of socialism run amok, with the inevitable consequence being a unproductive and inefficient economy in which no sane capitalist would dare to invest. Now, is the experience of Denmark replicable in the United States? I doubt it, mainly because the heterogeneous nature of the United States (ethnically and otherwise) makes it difficult to impossible to sustain a nationwide consensus for a generous and universal social safety net. (See my discussion of Robert Putnam’s research.) However I think the example of Denmark does call into question a facile identification of liberty solely with low taxes and small government. Although the U.S. prides itself (and rightly so) in being a traditional beacon of freedom to the world, the world may yet have a thing or two to teach the U.S. about freedom.